What does the word Chickee mean? Definition: T he word 'Chickee' or 'Chikee' means "house" in the Creek language spoken by the Seminoles. The Chickee stilt house was constructed from cypress logs used a posts to support a raised open-sided floor and a thatched roof. 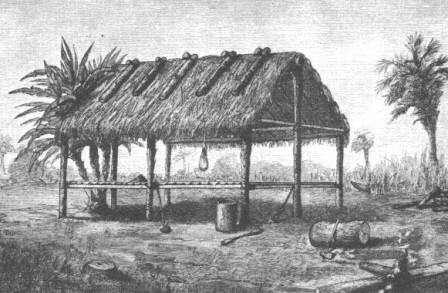 The thatch was weaved from palmetto palm leaves held in place with vines or thin ropes (cordage). There was also a platform floor, raised about 3 or 4 feet above the ground. A ladder was used to climb up to the platform floor. The Chickees had no walls so, during rainstorms, coverings, made from hide or canvass, were attached to the frame to keep the inside of the Chickee dry. Alternatively, the thatched roof would be built so it reached down to the platform floor.